By 2025, prevent and significantly reduce marine pollution of all kinds, in particular from land-based activities, including marine debris and nutrient pollution. By 2020, sustainably manage and protect marine and coastal ecosystems to avoid significant adverse impacts, including by strengthening their resilience, and take action for their restoration in order to achieve healthy and productive oceans. Minimize and address the impacts of ocean acidification, including through enhanced scientific cooperation at all levels. By 2020, effectively regulate harvesting and end overfishing, illegal, unreported and unregulated fishing and destructive fishing practices and implement science-based management plans, in order to restore fish stocks in the shortest time feasible, at least to levels that can produce maximum sustainable yield as determined by their biological characteristics. By 2020, conserve at least 10 per cent of coastal and marine areas, consistent with national and international law and based on the best available scientific information. By 2020, prohibit certain forms of fisheries subsidies which contribute to overcapacity and overfishing, eliminate subsidies that contribute to illegal, unreported and unregulated fishing and refrain from introducing new such subsidies, recognizing that appropriate and effective special and differential treatment for developing and least developed countries should be an integral part of the World Trade Organization fisheries subsidies negotiation. By 2030, increase the economic benefits to Small Island Developing States and least developed countries from the sustainable use of marine resources, including through sustainable management of fisheries, aquaculture and tourism. Increase scientific knowledge, develop research capacity and transfer marine technology, taking into account the Intergovernmental Oceanographic Commission Criteria and Guidelines on the Transfer of Marine Technology, in order to improve ocean health and to enhance the contribution of marine biodiversity to the development of developing countries, in particular small island developing States and least developed countries. Provide access for small-scale artisanal fishers to marine resources and markets. The world’s oceans—spreading over 70 per cent of the planet—are in crisis from decimated fish stocks, pollution and acidification. Sustainable management is essential, since oceanic changes can result in globally significant climate shifts. Equally vital is the protection of human livelihoods. Nearly a billion people, 12 percent of the global population, depend on oceans, seas and marine resources to survive. In Central and Southern Asia, where 16.6 per cent of women are employed in fishing, aquaculture and related activities, marine contamination may have an even larger impact. Women face the risks of ocean degradation with fewer assets and alternatives for income, and less resilience against mounting losses. Fishing and aquaculture are marked by significant occupational segregation, with men primarily involved in fish and aquaculture harvesting, and women largely concentrated in low-skilled, low-paid secondary jobs such as fish processing and marketing. They often work without contracts or health, safety and labour rights protections. Many are constrained by the lack of access to technology and other resources, even basic refrigeration to keep fish stocks fresh. The maritime industry is almost completely managed by men. In 2016, only one of the top 100 seafood companies was run by a woman. UN Women works to empower women in ocean-based livelihoods and to lead sustainable development efforts. Yayi Bayam Diouf, 68, broke many stereotypes when she became the first fisherwoman in her village in Senegal. Now, she uses her skills and knowledge to help other women secure livelihood through sustainable fishing and fish farming. For island communities, the declining health of the oceans threatens lives, livelihood and food security. In the island nation of Seychelles, ocean-based tourism is the backbone of the economy and men and women rely on the ocean for sustainable living. 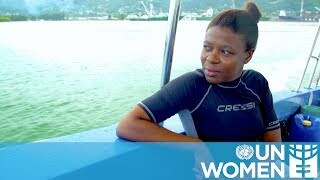 Women are also leading marine conservation and sustainable use of the ocean in Seychelles. In South-West Colombia, where the civil war has left lasting impact, the Nueva Vida (New Life) project, aims to boost women’s income and participation in the fishing sector through trainings on business skills, marine legislation, sustainable fishing practices and environmental management. UN Women (2018), Turning promises into action: Gender equality in the 2030 Agenda. The world’s oceans are in crisis. Climate change has thrown marine ecosystems out of balance, as have pollution and ocean acidification. UN Women works to address women’s and girl’s vulnerability to climate change and make them leaders in sustainable development.